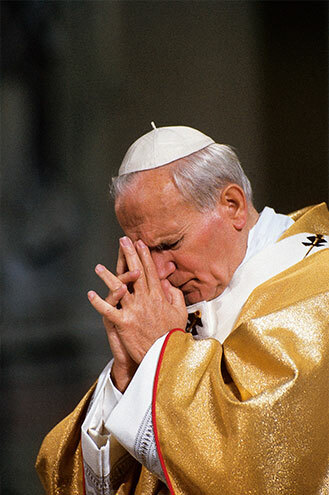 Blessed John Paul II was a “man of prayer”. The center of his life was founded on the Eucharist. His deep faith is confidence in God’s help in the crucial events of life, as well as the total surrender in the maternal help of the Blessed Virgin Mary, which manifested itself with particular intensity in moments of obscurity, as that of the tragic attack of 1981 or during the hard road of the advancing illness. He always gave thanks and attributed to God every merit and good gift received. His difficult childhood - marked by three family losses, the entrance into seminary just as the war forcibly closed its doors - certainly invigorated his courage. As Archbishop of Cracow, he never hesitated before the numerous obstacles imposed by the Polish communist regime for the right to profess the faith. With fortitude he knew how to intervene in favor of human rights, without agitating public orders. The first motto “Do not be afraid! Open, indeed, open wide the doors to Christ!” pronounced during the opening celebration of his ministry, marked the program of his long Pontificate, which has remained alive in the hearts of the faithful even after his death. As Supreme Pontiff, on May 13, 1981, the day that marked the second phase of his pontificate, he obtained from the Lord the grace to shed his blood in the name of faith, as he himself once stated in reference to the fact. In the countless spiritual trials and physical illness he bore, he witnessed the precious salvific value of human suffering united to the mystery of the Cross of Christ. He sustained the longing for the liberty of peoples oppressed by various regimes and totalitarianisms, affirming the inviolable dignity of every human being. He promoted and gave new life to ecumenical dialogue, seeking unity and peace with hope in the future of full communion with our separated brothers. An exceptional sign of his hope was the trust that he placed in the young, the hope of the Church of tomorrow. Giving clothing and food to those in need, taking care of the homeless, of an aged family member, sharing in the pain of others, giving of his own means, visiting the sick and imprisoned... Moreover, he instructed, gave advice, comfort to the loss of heart, offered his forgiveness to the aggressor and to all those who offended him, and endured with patience those who were hostile towards him. Towards the end of the 90’s, the first symptoms of Parkinson’s disease appeared, which little by little forced him to continue his ministry from a wheel chair. Everyone saw with particular participation and admiration, the fortitude with which he knew how to manage all of his pastoral duties despite the difficult conditions. was born in Wadowice (Poland) on May 18, 1920, the second of two children. His mother died when he was only 9 years old. His older brother Edmund, a doctor, died in 1932 and his father, an officer in the armed forces, died in 1941. He attended the University of Jagellónica of Cracow for only a year before it was closed by Nazi armed forces in 1939. Afterwards, the young Karol worked in a mine and then in a chemistry factory to earn a living and avoid deportation to Germany. He also attended the underground formation courses of the major seminary of Cracow and following the war, was ordained a priest on November 1, 1946. Sent to Rome, he obtained a doctorate in Theology with a thesis based on faith in the works of St. John of the Cross. In 1948, he returned to Poland and received a ministerial assignment in a few parishes before being appointed as a University Chaplain until he pursued further studies in Philosophy and Theology in 1951. On July 4, 1958, Pope Pius XII nominated him Auxiliary Bishop of Cracow. He received Episcopal Ordination on September 28, 1958. On January 13, 1964, he was nominated Archbishop of Cracow by Paul VI and then Cardinal on June 26, 1967. He was a participant in the Second Vatican Council (1962-65) and made an important contribution to the constitution Gaudium et Spes while taking part in five assemblies of the Synod of Bishops prior to his Pontificate. Karol Wojtyła was elected Pope on October 16, 1978 and began his ministry as Universal Shepherd of the Church on October 22nd. During his pontificate, he made 146 pastoral visits within Italy and as Bishop of Rome, he visited 317 of the 332 existing parishes in the city. His apostolic visits throughout the world numbered 104. Among the primary documents he penned are 14 Encyclicals, 15 Apostolic Exhortations, 11 Apostolic Constitutions and 45 Apostolic Letters. As Pope he also wrote five books. He celebrated 147 beatification ceremonies, during which he beatified 1,338 men and women as well as 51 canonizations, for a total of 482 saints. On May 13, 1981 in St. Peter’s Square, an attack was made on his life. 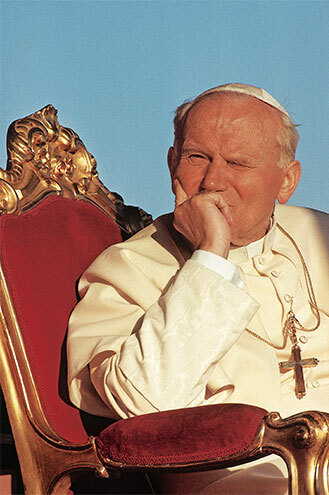 Following a long hospitalization, John Paul II forgave his assailant and fully aware of the miracle that spared his life, he intensified his pastoral commitments with heroic generosity. His solicitude as Shepherd of the Church was expressed by the erection of numerous dioceses, with the promulgations of the Latin Code of Canon Law and the Code of Canon Law for the Oriental Churches as well as with the revision of the Catechism of the Catholic Church. He also proclaimed a Year of Redemption, a Marian Year, and a Eucharistic Year along with the Great Jubilee Year of 2000. He brought the younger generations of Christians closer by initiating the World Youth Day celebrations. He was called to his heavenly reward from Rome, in the Vatican Apostolic Palace, on Saturday, April 2, 2005 at 9:37 pm (Rome time), on the vigil of Domenica in Albis and Divine Mercy Sunday, which he had instituted. On April 8th, he was buried in the Vatican Grotta, after the solemn funeral rite celebrated in St. Peter’s Square. 02 On 3 May 2005, Cardinal Camillo Ruini (Cardinal Vicar of the Diocese of Rome where John Paul II died) presents to the Congregation for the Cause of Saints, the letter which expresses the desire on behalf of the Diocese of Rome to establish the act for the cause of canonization of the Deceased Pontiff as well as a dispensation from the five year time lapse from the death to the opening of the Diocesan investigation. 04 The beginning of the Cause of Beatification, the Diocesan phase: June 28, 2005. Starting with the Tribunal’s investigation and gathering of: documents regarding the candidate; testimonials of the heroic exercise of Christian virtues (Theological virtues of faith, hope and charity; Cardinal virtues of prudence, justice, temperance, fortitude; others that are specific to one’s own state of life). From this moment, John Paul II is Servant of God. On April 2, 2007, in the Basilica of Saint John Lateran of Rome, Cardinal Camillo Ruini declares the final Diocesan phase of procession to the Beatification of John Paul II, after the consignment of the results to the Congregation for the Cause of Saints. 05 Beginning of the Vatican phase: May 4, 2007. All the acts were transmitted to the Congregation for the Cause of Saints, and having obtained the decree of validity, the Postulation follows, under the direction of a redactor, the preparation of the Positio (a synthesis of documentation that approves the heroic exercise of virtues) which was then submitted to the examination of nine theologians. This phase is followed by the ‘promoter of faith’ (who has the same duties as the promoter of justice - namely a profound study of the cause with an evaluation of eventual controversial questions - followed by the conclusions). 06 Promulgation of the Decree that recognized the heroic virtues of the Servant of God, John Paul II. On December 19, 2009, Pope Benedict XVI approved the iter (procedure) of the cause for the Beatification of John Paul II and authorized the Congregation for the Cause of Saints to revise the Decree concerning his heroic virtues. John Paul II is now proclaimed Venerable. 07 On October, 21, 2010, seven specialists of a medical commission confirmed the inexplicable scientific circumstances surrounding the healing of Sr. Marie Simon-Pierre Normand. On December 14, 2010, a Congress of theologians unanimously recognized the efficacy of John Paul II’s intercession in the recovery of Sr. Marie Simon-Pierre Normand. On January 11, 2011, Cardinals and Bishops of the Congregation gave their unanimous consensus of proclaiming the full recovery of the French nun as miraculous. On January 14, 2011, Benedict XVI authorized the promulgation of the decree attributing the miracle to the intercession of John Paul II. The miracle regarded the full healing of French religious sister, Sr. Marie Simon-Pierre Normand (of the Petites Soeurs des Maternités Catholiques) from Parkinson’s Disease (the same illness that John Paul II also suffered). Her illness had been diagnosed in 2001. According to the Sister’s testimony, the healing by intercession of the Pope took place during the night of June 2-3, 2005. During the celebration of the Beatification rite, a woman from Costa Rica, Floribeth Mora Diaz, was healed from her “cerebral fusiform aneurysm”. The case was made known to the Postulator, after having taken the necessary preliminary steps, he asked the Bishop of San José di Costa Rica to assemble the Diocesan Tribunal and begin a Diocesan examination. The latter took place between November 20 – December 2, 2012. The Congregation for the Cause of the Saints recognized the validity of the occurrence with a decree on February 12, 2013. A medical consultant group gathered on February 28, 2013 to examine the facts and expressed unanimously their favorable opinion regarding the lack of scientific explanations for the healing. The case was closed, with a positive final verdict by the board of theologian consultants on April 10, 2013 and by Cardinals and Bishops on July 2, 2013. 09 On July 5, 2013, Pope Francis approved the miracle attributed to the intercession of the Blessed John Paul II and authorized the Congregation for the Cause of the Saints to promulgate the Decree super miraculo to open the road towards Canonization. This miracle regarded the healing of a woman from Costa Rica, Floribhet Mora, on the evening of May 1, 2011, the same night of John Paul II’s Beatification. That very day, the woman who had suffered from a severe cerebral wound, had prayed to him to be healed. Through the intercession of John Paul II, the the woman’s entire family has re-found their faith, producing almost a double miracle. 10 During the Ordinary Consistory on September 30, 2013, the date for the Canonization of John Paul II was set for April 27, 2014. 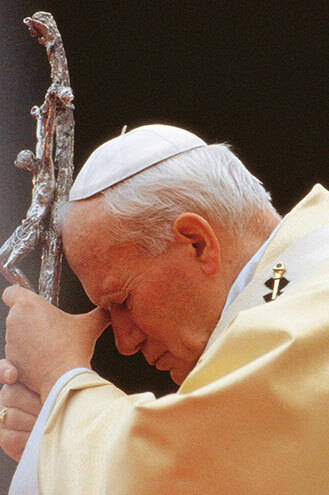 O Saint John Paul, grant us your blessing from Heaven’s window! Bless the Church which you have loved, served and guided, encouraging her to walk the roads of the world, so to carry Jesus to everyone, and everyone to Jesus. Bless the youth, who have been your great passion. Guide them so that they may dream again, raise their eyes on high and find the light that illumines the meaning of all life here below. Bless all families, bless each family! You have foreseen the assault of satan against this precious and indispensable spark of Heaven which God has ignited upon earth. Saint John Paul, with your prayer, protect the family and each life which blooms in the family. Pray for the whole world, still marked by tensions, war and injustice. You have fought against war by summoning dialogue and by sowing love; pray for us, so that we may be tireless sowers of peace. O Saint John Paul, from Heaven’s window, where we see you alongside Mary, make the blessing of God come down upon us. Amen.